Alan Stubbs senses the Hibs fans are now buying into what he is trying to do after his team were cheered off the pitch following last night’s agonising penalty shoot-out defeat against Dundee United. The Hibees produced one of their best home performances for several years to draw 3-3 with the high-flying Premiership outfit in a pulsating League Cup quarter-final tie at Easter Road. However, they eventually succumbed in a dramatic penalty shoot-out, which United won 7-6 after Radoslaw Cierzniak saved from Hibs pair Matt Kennedy and David Gray to spare the blushes of former Hibee John Rankin, who had been the first player to miss. 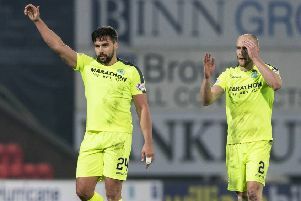 Despite suffering late heartbreak for the second time in as many games after Hearts struck a stoppage-time equaliser against them in the Championship on Sunday, the proud Hibs fans made clear their appreciation for their team’s efforts with a rousing ovation at the end. Stubbs and his team were criticised during a slow start to the season, but, after an impressive run of seven games in which they haven’t lost in regulation play, the head coach believes the supporters are now starting to acknowledge that he is gradually producing a team which can entertain them. “The fans have had a tough time and I totally appreciate that,” he told the Evening News, “but I think they can now see they’ve got a team that’s putting their neck on the line and going that extra yard to try and give them something to cheer about. When the fans stay to the very death and give the team a standing ovation and cheer them off, I think that tells you everything. We’ve come a long way in a short space of time. I think they’ve seen with their own eyes that we’re trying to bring a different type of football to what they saw last season. We know what Hibs fans have been historically used to – a free-flowing, passing style of football. In order to do that, there are certain elements you have to work on until you get to the final outcome. We won’t get there overnight, but I think the fans can see that it’s changing. The manager admitted he was more elated with the performance than deflated with the result. “Even though we lost, I feel like we’ve won,” he said. “I’m proud of my team – to have played two games in the space of three days and performed like that is a real credit to them. They’ve showed everything.